Celebrity, fame and public attention paid to individuals are rampant in our media-saturated culture. Of course, the world of classical music has its own celebrities, well known to devotees and fans. This week’s program by the Atlanta Symphony Orchestra was a lesson about classical music celebrityhood. The next work was the 1898 Violin Concerto by Julius Conus, a curious non-celebrity composer. His Wikipedia page talks about his father, brother, and children, but not much about his own work as a composer, and the last time Conus’ work was played in Atlanta was 26 years ago. The ASO program notes say that he assisted Russian celebrity composer Tchaikovsky in the violin fingerings for his Sixth Symphony. 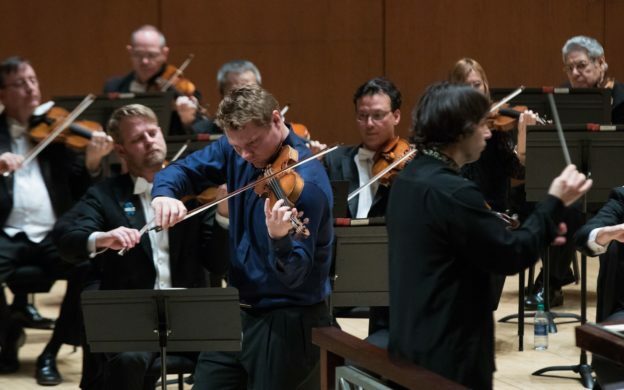 The violin soloist for this performance was ASO’s concertmaster David Coucheron, who in Atlanta is at the top of the classical music celebrity list. He, more than almost any other musician, could be said to be “the public face of the ASO.” His performances always fill the house and this concert was no exception. The piece is relatively short, at about 19 minutes, and it consists of three movements, played without break, but musically it is two movements – one long first movement with a second movement inserted in its middle, separating its beginning from its ending. In spite of the technical fireworks it contains, its richness of ideas and hints of skill in construction, this concerto lacks memorable melodies. It is best viewed as a vehicle for the soloist to demonstrate technical mastery, which is Coucheron’s strength. As a soloist, he has integrity and his playing never condescends toward lesser musical material such as this concerto. Coucheron has the ability to generate grand volume without ever sounding shrill or stringy. That strength made for great balances between orchestra and soloist so that the former never overwhelmed the latter. Credit also goes to Nánási for helping to achieve excellent balance. This was a great performance of a not-so-great work. The audience showed its appreciation, and in response, Coucheron returned to the stage with principal second violin Julianne Lee in a brilliant encore of Johan Halvorsen’s Concert caprice on Norwegian melodies for two violins. They played with humor and demonstrated great mastery of the sometimes highly challenging material. Artikkelen publisert på Bachtrack 9. mars 2019.